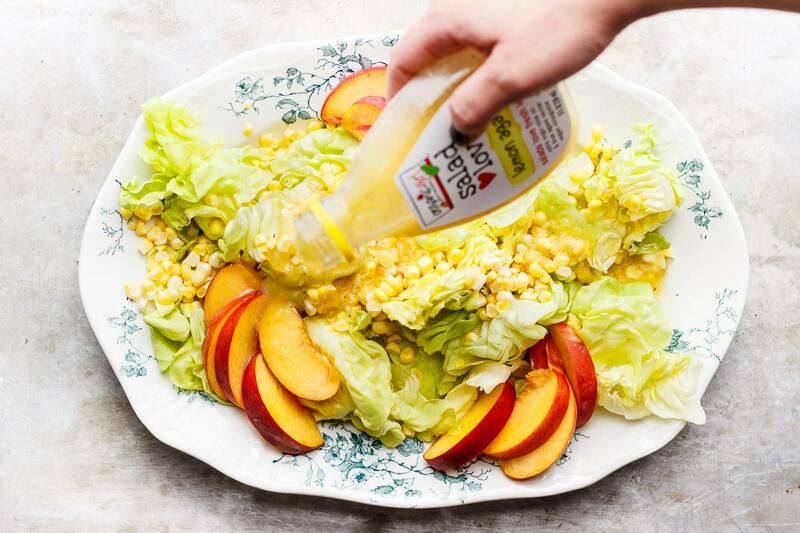 A fresh, summery, delicate butter lettuce salad with peaches, sweet corn and a light lemon agave dressing. An easy salad with loads of flavor and crunch. Fresh, summery, butter lettuce salad. I thought after your long holiday weekend. That you would want to eat a salad. So here’s a summery, butter lettuce salad made with my favorite salad greens, organicgirl’s butter greens. And their new lemon agave dressing. It’s refreshing and crunchy and revitalizing. It’s really everything I want from a salad in the summertime. I’ve teamed up with organicgirl for their Eat Your Hearts Out Tour here in St. Louis. For three Saturdays in July, I’ll be making these butter lettuce salads, pairing them with some crisp wines and chatting with you guys. It’s free and I’d love for you to come and join me. The best part is that you can win some amazing things like free lettuce for a year! Also, if you’re in the St. Louis area I will be participating in Feast Magazine’s Taste & See event on July 21. Come eat my food and hang with me and some of my local chefs. Tickets are only $15. Hurry because this event is slated to sell out real quick. Lastly! Can I ask a favor of you? The annual Saveur Blog Award nominations are happening now. If you love what I do, I would love for you to tell them for me. Click here to nominate myself and all of your other favorite bloggers too. You can nominate With Food + Love in whatever categories you think are most fitting, but I think ‘The Food Obsessive Award: Best Special Interest Blog’ might be the best fit. Thank you, I love you, always and forever. The best thing about this salad is that the greens are washed and ready to go. Making prep super easy. The lemon agave dressing can be substituted out with any basic [url href=”http://withfoodandlove.com/winter-chopped-kale-salad/” target=”_blank”]lemon vinaigrette[/url]. 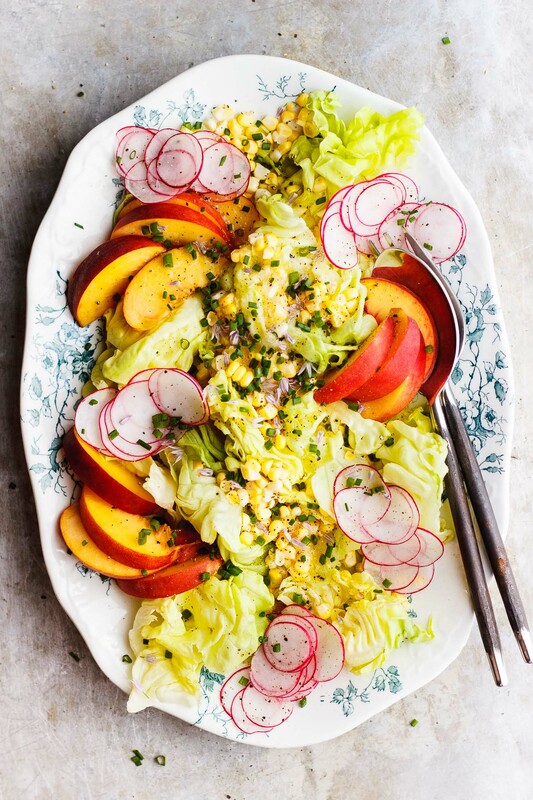 Layer the lettuce and corn and peaches on a platter. Top with radishes and chives. The post is sponsored by organicgirl; all opinions are my own. This is super pretty! I love the sweetness of the corn and the peaches here. That lemon agave dressing sounds wonderful as well. 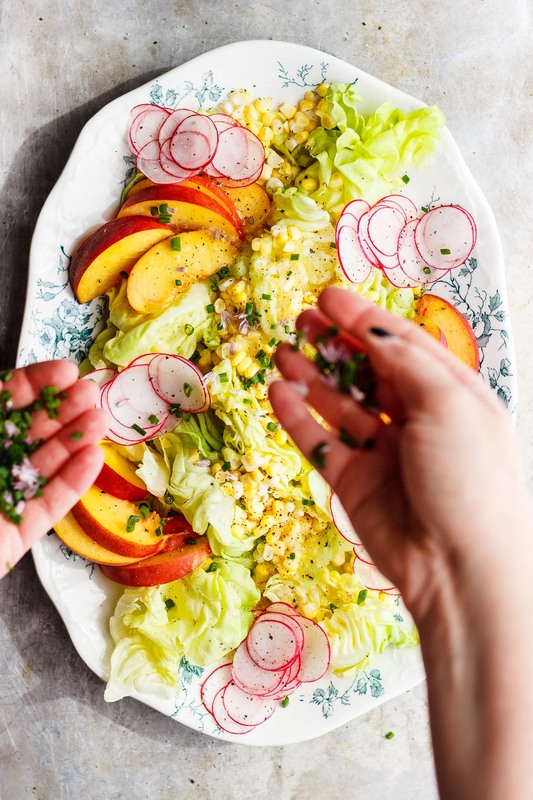 I love butter lettuce and everything you added to this salad looks delightfully summery! Such a beautifully composed salad! organicgirl’s salad dressings are the only ones in the grocery store I buy. Ingredient list is top notch. Have so much fun with the tour, wish I could come and see you at one of the stops, xo. Oh my gosh! I so wish I lived closer and could come eat salads and hang with you at these salad Saturdays! 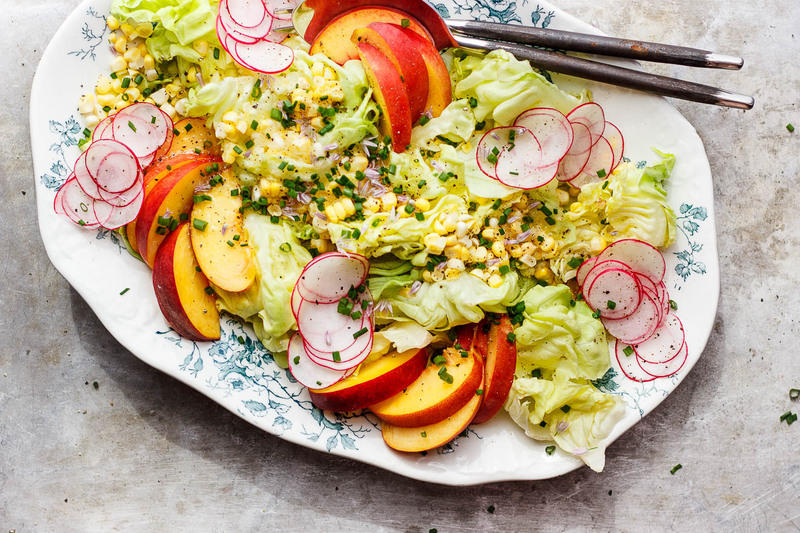 I’m obsessed with the mix of peach and radishes – yum! What a beautiful salad! 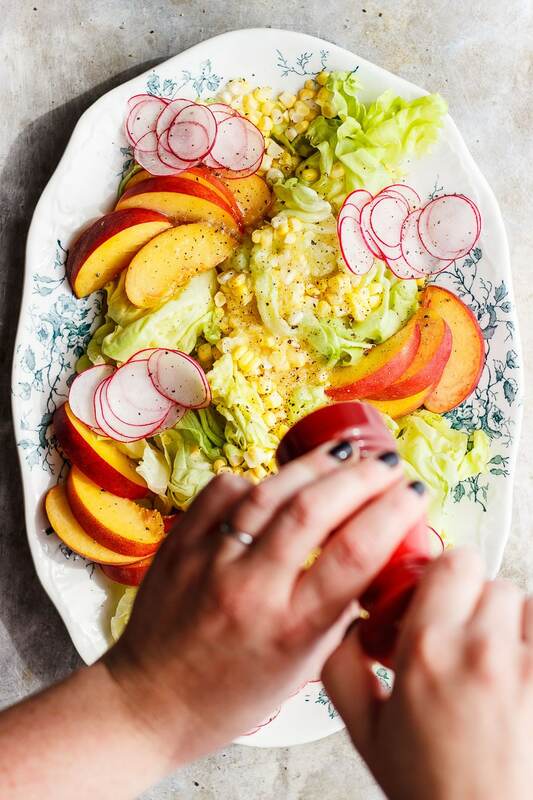 Peaches and corn are my new favorite summer combination.